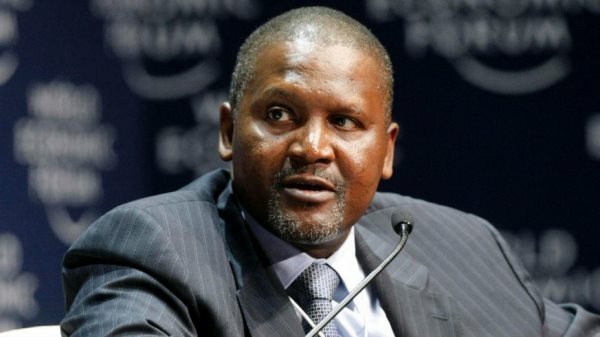 AFRICANGLOBE – Against the background of Nigeria’s economic vulnerability, President of Dangote Group, Aliko Dangote has stated that the current efforts of the Nigerian Federal Government at diversifying the economy to an agriculture-centered economy remain the viable solution to creating a healthy economy. Dangote said this during a meeting with some business men from Asia, in Lagos. He said: “We have invested massively in rice, sugar, dairy products, and tomatoes. Our rice-out grower scheme will produce rice by next year that will reduce our rice import to nearly zero because Nigeria imports more than half of the rice it consumes. We have expanded our sugar operations with our operations in Tonga in Nasarawa in addition to Numan sugar projects where sugarcane is cultivated for raw sugar production that will be refined. In addition, Dangote said his company was investing massively in agribusiness, promoting industrialization through the backward integration process to ensure Nigeria becomes self-reliant in food production in good time and save it of the much needed foreign exchange hitherto being spent on importation. His words: “We are producing the raw materials needed in our factories. In the Sugar sector, we developed a sugar backward integration project plan targeted at the production of 1.5MT/PA from various sites across Nigeria, in the next 10 years. Dangote explained further that in the second phase, other mills will be built in Nasarawa, Kogi, and other states, noting that with the six mills, the company will achieve a capacity of seven hundred thousand metric tons per annum of parboiled rice. He said his Dangote Rice Company will become largest rice producer in Africa, a bold step in making Nigeria self-sufficient in Rice production. He commended the Federal Government’s economic recovery and growth plan, saying his investments in refinery, petrochemical and fertilizer production are in that direction. He said the private sector has important roles to play which was why he has taken up the challenge to lead the way as a leading private sector operator and that with government providing the right environment through good policy formulation and implementation; it will be a matter of time before Nigeria would become one of the world’s economic powers. Previous articleDid This Entrepreneur Really Make $1 Million In 90 Minutes?